One of the great things about conferences is that there is time to chat in person with distant friends and collaborators. Last July, at the ISMB conference in Berlin, I found myself doing just that during one of the coffee breaks. Suddenly, Manolis Kellis approached me and asked to talk in private. The reason for his interruption: he came to request that I remove an arXiv post of mine, namely “Comment on ‘Evidence of Abundant and Purifying Selection in Humans for Recently Acquired Regulatory Functions“, a response to a paper by Ward and Kellis. Why? He pointed out that my arXiv post was ranking highly on Google. This was inconvenient for him, he explained, while insisting that it was wrong of me to post a criticism of his work on a forum where he could not directly respond. He suggested that it would be best to work out any issues I might have with his paper offline. Unfortunately, there was the inconvenient truth that arXiv postings cannot be removed. Unlike some journals, where, say, a supplement can be revised while having the original removed (see the figure switching of Feizi et al. ), arXiv preprints are permanent. My initial confusion quickly turned to anger. After all, my arXiv comment had been rejected from Science where I had submitted it as a technical comment on the Ward-Kellis paper. I had then put it on the arXiv as a last resort measure to at least have some record of my concerns publicly accessible. How is this wrong? Can one not critique the work of Manolis Kellis? My first review of a Manolis Kellis paper was in the fall of 2006, in my capacity as a program committee member of the Research in Computational Molecular Biology (RECOMB) conference held in Oakland, CA in 2007. Because Oakland is right next to Berkeley, a number of Berkeley professors were involved in organizing and running the conference. Terry Speed was chair of the program committee. I was out of the country that year on sabbatical at the University of Oxford, so I could not participate, or even attend, the conference, but I volunteered to serve on the program committee. For those not familiar with the RECOMB review process, it is modeled after the standard Computer Science conferences. The program committee chair forms the program committee, who are then assigned a handful of papers to review and score. Reviews are entered on a website, and after a brief period of online discussion about borderline papers, scores are revised and accept/reject decisions are made. Authors can revise their manuscripts, but the reviewers never see the papers again before publication in the proceedings. One of the papers I was assigned to review was by a student named Joshua Grochow and his advisor Manolis Kellis. The paper was titled “Network Motif Discovery Using Subgraph Enumeration and Symmetry-Breaking“. Although networks were not my research focus at the time, and “symmetry-breaking” evoked in me nightmares from the physics underworld, I agreed to the review. The paper seemed to contain some interesting algorithms, appeared to have a combinatorial flavor, and potentially important applications- a good mix for RECOMB. The problem addressed by Grochow & Kellis was that of identifying “network motifs” in biological networks. “Motifs” can be defined in a variety of ways, and the Grochow-Kellis objective was simple. In graph theoretic terms, given a graph G, the goal was to find subgraphs occurring with high multiplicity to an extent unlikely in a random graph. There are many models for random graphs, and the one that the results in Grochow-Kellis are based on is the Erdös-Renyi model (each edge chosen independently with some fixed probability). The reason this definition might be of biological interest, is that recurrent motifs interspersed in a graph are likely to represent evolutionarily conserved interaction modules. The paper begins with a description of the method. I won’t go into the details here, except to say that everything seemed well until I read the caption of Figure 3. There the number 27,720 caught my eye. The significance of this is that the “motif” on the left-hand side of Figure 3 had appeared many times because of a type of double- or rather thousandfold- counting. Instead of representing statistically significant recurring independent motifs, this “motif” arises because of a combinatorial artifact. In the specific example of Figure 3, the motif occurred once for any choice of 4 nodes from the clique of size 9, and any choice of 3 nodes from the stable set of size 12. The point is that in a graph, any subgraph attached to a large clique (or stable set) will occur many times. This simple observation is a result of the fact that there are many subgraphs of a clique (or stable set) that are identical. I realized that this meant that the Grochow-Kellis method was essentially a heuristic for finding cliques and stable sets in graphs. 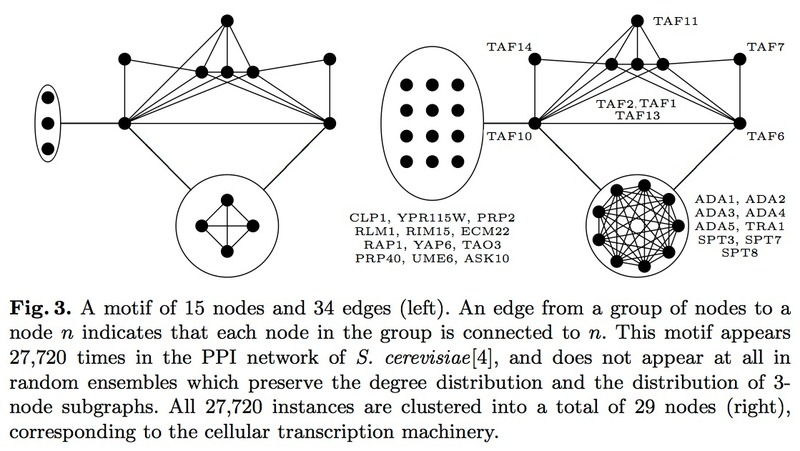 The particular “network motifs” they were pulling out were just subgraphs that happened to be connected to some large cliques and stable sets. There are two problems with this: first, a clique or a stable set can hardly be considered an interesting “network motif”. Moreover, the fact that they appear in biological networks much more than in Erdös-Renyi random graphs is not surprising. Second, there is a large literature on finding cliques in graphs, none of which Grochow-Kellis cited or seemed to be familiar with. The question of the performance of the Grochow-Kellis algorithm is answered in their Figure 3 as well. There is a slightly larger motif consisting of 6 nodes from the stable set of size 12, instead of 3. That motif occurs in all subsets of the stable set instead of subsets which means that there is a motif that occurs 116,424 times! Grochow and Kellis’s algorithm did not even achieve its stated goal. It really ought to have outputted the left hand side figure with six nodes in the stable set on the left, and not three. In other words, this was a paper providing uninteresting solutions from a biological point of view, and doing so poorly to boot. I wrote up a detailed report on the paper, and posted it on the RECOMB review website together with poor scores reflecting my opinion that the paper had to be rejected. How could RECOMB, ostensibly the premier computer science conference on computational and algorithmic biology, publish a paper with neither a computational nor biological result? Not to mention an algorithm that demonstratably did not find the most frequently occurring motif. As you might already guess, my rejection was subsequently overruled. I don’t know who made the final decision to accept the Grochow & Kellis paper to the RECOMB conference, although presumably it was the program committee chair. The decision jarred with my sense of scientific integrity. I had put considerable effort into reviewing the paper and understanding it, and I felt that I had provided a compelling objective argument for why the paper was fundamentally flawed- the fact that the results were trivial (and incorrect!) was not a subjective statement. At this point I need to point out that the RECOMB conference is quite difficult to get into. The acceptance rate for papers in 2007, consistent with other years, was 21.8%. I knew this meant that even a single very negative review, especially one with a compelling argument against the paper, almost certainly would lead to rejection of the paper. So I couldn’t understand then, nor do I still understand now, on what basis the decision was made to accept the paper. This bothered me greatly, and after much deliberation I started boycotting the conference. Despite publishing five RECOMB papers from 2000 to 2006 and regularly attending the meeting during that time, the continued poor decisions and haphazard standards for papers selected have led me to not return in almost 8 years. Grochow and Kellis obviously received my review and considered how to “deal with it”. They added a section titled “The role of combinatorial effects”, in which they explained the origins of the number 27,720 that they gleaned from my report, but then spun the bad news they had received as “resulting from combinatorial connectivity patterns prevalent in larger network structures.” They then added that “…this combinatorial clustering effect brings into question the current definition of network motif” and proposed that “additional statistics…might well be suited to identify larger meaningful networks.” This is a lot like someone claiming to discover a bacteria whose DNA is arsenic-based and upon being told by others that the “discovery” is incorrect – in fact, that very bacteria seeks out phosphorous – responding that this is “really helpful” and that it “raises lots of new interesting open questions” about how arsenate gets into cells. Chutzpah. When you discover your work is flawed, the correct response is to retract it. I don’t think people read papers very carefully. Joshua Grochow went on to win the MIT Charles and Jennifer Johnson Outstanding M. Eng. Thesis Award for his RECOMB work on network motif discovery. [Added February 18: Grochow and Kellis have posted a reply here]. I have to admit that after the Grochow-Kellis paper I was a bit skeptical of Kellis’ work. Not because of the paper itself (everyone makes mistakes), but because of the way he responded to my review. So a year and a half ago, when Manolis Kellis published a paper in an area I care about and am involved in, I may have had a negative prior. 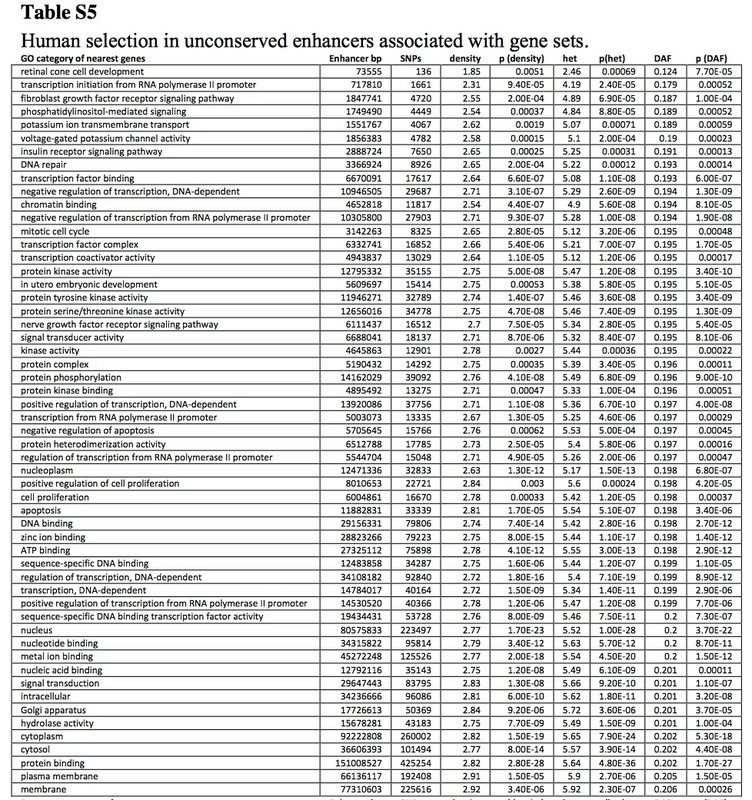 The paper was Luke Ward and Manolis Kellis “Evidence for Abundant and Purifying Selection in Humans for Recently Acquired Regulatory Functions”, Science 337 (2012) . Having been involved with the ENCODE pilot, where I contributed to the multiple alignment sub-project, I was curious what comparative genomics insights the full-scale $130 million dollar project revealed. The press releases accompanying the Ward-Kellis paper (e.g. The Nature of Man, The Economist) were suggesting that Ward and Kellis had figured out what makes a human a human; my curiosity was understandably piqued. Ward and Kellis combined population genomic data from the 1000 Genomes Project with biochemical data from the ENCODE project to look for signatures of human constraint in regulatory elements. Their analysis was based on measuring three different proxies for constraint: SNP density, heterozygosity and derived allele frequency. To identify specific classes of regulatory regions under constraint, aggregated regions associated with specific gene ontology (GO) categories were tested for significance. Reading the paper I was amazed to discover they found precisely two categories: retinal cone cell development and nerve growth factor receptor signaling. It was only upon reading the supplement that I discovered that their tests had produced 53 other GO categories as well (Table S5). Despite the fact that the listed categories were required to pass a false discovery rate (FDR) threshold for both the heterozygosity and derived allele frequency (DAF) measures, it was statistically invalid for them to highlight any specific GO category. FDR control merely guarantees a low false discovery rate among the entries in the entire list. Moreover, there was no obvious explanation for why categories such as chromatin binding (which had a smaller DAF than nerve growth) or protein binding (with the smallest p-value) appeared to be under purifying selection. As with the Feizi et al. paper, the supplement produced a story much less clean than the one presented in the main body of the paper. In fact, retinal cone cell development and nerve growth factor were 33 and 34 out of the 55 listed GO categories when sorted by the DAF p-value (42 and 54 when sorted by heterozygosity p-value). In other words, the story being sold in the paper was based on blatant statistically invalid cherry picking. Ward and Kellis were therefore proposing that some features might have a negative number of nucleotides under constraint. 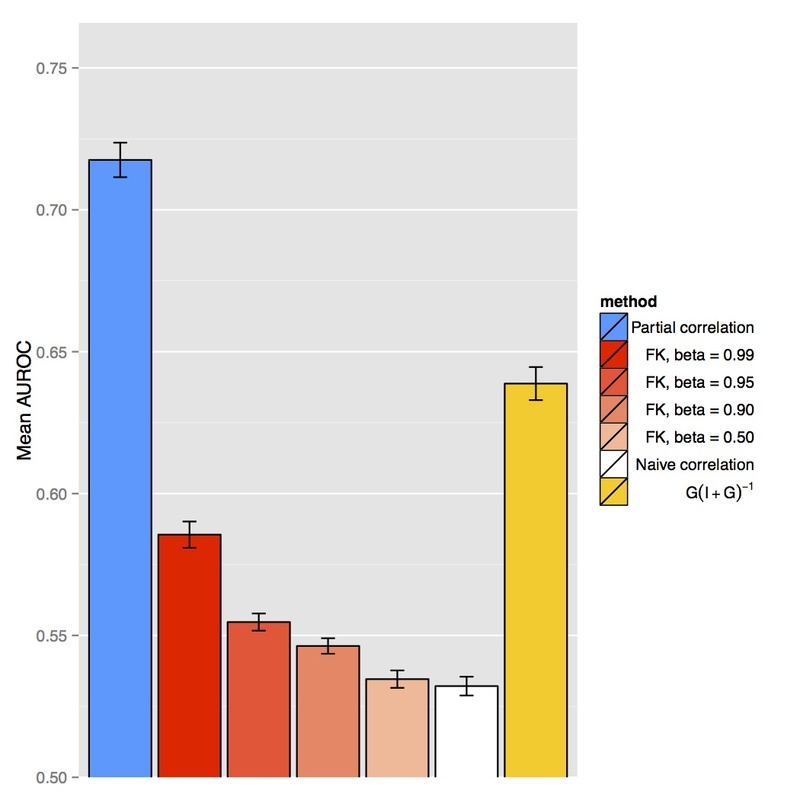 Moreover, while it is possible that after further rescaling PUCF might have correlated with the true proportion of nucleotides under constraint, there was no argument provided in the paper. Thus, while Ward and Kellis claimed to have estimated the proportion of nucleotides under constraint, they had only computed a statistic named “proportion under constraint”. Nicolas Bray and I wrote up these points in a short technical comment and submitted it to the journal Science early in November 2012. The comment was summarily rejected with a curt reply by senior editor Laura Zahn stating that “relative to other Technical Comments we have recently received we feel that the scope and focus of your comment make it more suitable for the Online Comments facility at Science, rather than as a candidate for publication as a Technical Comment.” It is worth noting that Science did decide to publish another comment: Phil Green and Brent Ewing’s, “Comment on’Evidence of Abundant and Purifying Selection in Humans for Recently Acquired Regulatory Functions‘”, Science 10 (2013). Green and Ewing’s comment is biological in nature. Their concern is that “… the polymorphism trends are primarily attributable to mutational variation and technical artifacts rather than selection.” Its fine that Science decided to host a debate on a biology question on its pages, but how can one debate the interpretation of results from a method, when the method is fundamentally flawed to begin with? After all, our problem with PUC was much deeper than a “technical flaw”. We decided at the end to place the comment in the arXiv. After doing so, it became apparent that it had little impact. Indeed, I have never received any feedback about it from anyone. Apparently even this was too much for Manolis Kellis. By the time I noticed the Feizi et al. paper in the journal Nature Biotechnology early in August 2013, my experiences reading Kellis’ papers had subtly altered the dynamic between myself and the printed word. Usually, when I read a paper and I don’t understand something, I assume the fault lies with me. I think most people are like this. But now, when the Feizi et al. paper started to not make sense, I didn’t presume the problem was with me. I tried hard to give the paper a fair reading, but after a few paragraphs the spell of the authors was already broken. And so it is that Nicolas Bray and I came to figure out what was really going on in Feizi et al., a project that eventually led us to also look at Barzel-Barabási. Speaking frankly, it was difficult work to write the blog posts about these articles. In addition to the time it took, it was exhausting and exasperating to discover the flaws, fallacies and frauds. Both Nick and I prefer to do research. But we felt a responsibility to spell out in detail what had happened here. Manolis Kellis is not just any scientist. He has, and continues to play leading roles in major consortium projects such as mod-ENCODE and ENCODE, and he has served on numerous advisory committees for the NHGRI. He is a member of the GCAT (Genomics, Computational Biology and Technology) study section until 2018. That any person would swap out a key figure in a published paper without publishing a correction, and without informing the editor is astonishing. That a person with great responsibility towards scientists is an abuser of science is unacceptable. Similarly, it isn’t hard to fool mathematicians into believing biological fables. Many mathematicians throughout the country were recently convinced by Jonathan Rothberg to donate samples of their DNA so that they might find out “what makes them a genius”. Such mathematicians, and their colleagues in computer science and statistics, take at face value statements such as “we have figured out what makes a human human”. In the midst of such confusion, it is easy for an enterprising “computational person” to take advantage of the situation, and Kellis has. I believe the solution for this problem is for computational biologists to start taking themselves more seriously. Whether serving as reviewers for journals, as panel members for funding agencies, on hiring/tenure committees, or writing articles, all of us have to tone down the hype and pay closer attention to the science. There are many examples of what this means: a review of a math/stats containing paper cannot be a single paragraph long and based on a hunch, and similarly computational biologists shouldn’t claim, as have many of the authors of papers I’ve reviewed in these posts, pathways to cure disease and explanations for what makes humans human. Don’t fool the biologists. Don’t fool the computer scientists, statisticians, and mathematicians. The possibilities for computational methods in biology are unlimited. The future is exciting, and there are possibilities for significant advances in areas ranging from molecular and evolutionary biology to medicine. But money, citations and fame cannot rule the day. The details of the #methodsmatter. Feizi et al.‘s paper describes a method called network deconvolution that in their own words provides “…a systematic method for inferring the direct dependencies in a network, corresponding to true interactions, and removing the effects of transitive relationships that result from indirect effects.” They claim that the method is a “foundational graph theoretic tool” and that it “is widely applicable for computing dependencies in network science across diverse disciplines.” This high brow language makes network deconvolution sounds very impressive, but what exactly is the method? Unfortunately, many matrices cannot be decomposed as an infinite sum of powers of some matrix as in equation (1), so equation (2) cannot be applied directly to arbitrary data matrices. The only mention of this issue in the main text of the paper is the statement that “This [eigenvalue] assumption can be achieved for any matrix by scaling the observed input network by a function of the magnitude of its eigenvalues.” This is true but incoherent. There are an infinite number of scalings that will satisfy the assumption, and while the authors claim in their FAQ that “the effect of linear scaling on the input matrix is that … it does not have an effect” this is obviously false (also if it has no effect why do they do it?). For example, as the scaling goes to zero, converges to . The problem with this model is that given there are an infinite number of solutions for and . Feizi et al.‘s approach to dealing with this is to introduce a scaling parameter that must be chosen a priori. They do not even mention the existence of this parameter anywhere in the main text. Instead, they choose to make a false statement in the caption of Figure 1 when they write “When these assumptions hold, network deconvolution removes all indirect flow effects and infers all direct interactions and weights exactly.” Even when satisfies the eigenvalue constraint, once it is scaled before applying equation (2) the matrix has probability zero of being recovered. Manolis Kellis received his B.S., M.S. and Ph.D degrees in computer science and electrical engineering from MIT, so it is hard to believe that he really thinks that solving (2), which requires nothing more than a matrix inversion, must be accomplished via eigendecomposition. In fact, inverting a 2000 x 2000 matrix in R is 50% slower using that approach. What is going on is that Kellis is hiding the fact that computation of the eigenvalues is used in Feizi et al. in order to set the scaling parameter, i.e. that he is actually solving (3) and not (2). Indeed, there is no mention of scaling in the video except for the mysteriously appearing footnote in the lower left-hand corner of the slide starting at 0:36 that is flashed for 2 seconds. Did you have time to think through all the implications of the footnote in 2 seconds, or were you fooled? Figure S4, July 14, 2013. In the words of the authors, the point of this figure is that “…choosing close to one (i.e., considering higher order indirect interactions) leads to the best performance in all considered network deconvolution applications.” However, while the supplement revealed the existence of , it did not disclose the values used for the results in the paper. We inquired with the authors and were surprised to discover that while was used for the protein networks and for the co-authorship network, was used for the DREAM5 regulatory networks violating their own advice. What rationale could there be for such a different choice, especially one very far away from the apparently optimal choice “near 1”? We asked the authors, who initially replied that the parameter setting didn’t make a difference. We then asked why the parameter would be set differently if its value didn’t make a difference; we never got an answer to this question. Although it may be hard to believe, this is where the story gets even murkier. Perhaps as a result of our queries, the scaling parameters were publicly disclosed by Feizi et al. in a correction to the original supplement posted on the Nature Biotechnology website on August 26, 2013. The correction states “Clarification has been made to Supplementary Notes 1.1, 1.3, 1.6 and Supplementary Figure 4 about the practical implementation of network deconvolution and parameter selection for application to the examples used in the paper. ” But Supplementary Figure 4 was not clarified, it was changed, a change not even acknowledged by the authors, let alone explained. Below is Figure S4 from the updated supplement for comparison with the one from the original supplement shown above. Figure S4, August 26, 2013. 1. If the authors believed their original figure and their original statement that close to 1 “leads to the best performance in all considered network deconvolution applications”, then why did they use for one of the applications? 2. When and how was the July 16th Figure S4 made? Manolis Kellis declined to answer question 1 and by not acknowledging the figure change in the correction did not permit the readers of Nature Biotechnology to ask question 2.
affinely map between 0 and 1 again. It is hard to say what steps 1–7 actually do. While it is impossible to give a simple analytic formula for this procedure as a whole, using the Sherman-Morrison formula we found that when applied to a correlation matrix C, steps 1, 2, 4, 6 and 7 produce a matrix whose ijth entry is (up to an affine mapping) where and m is the minimum entry of C. Omitting step 1 results in Pii , the inverse correlation matrix, so the effect of the mapping in this case is the addition of the final two terms whose possible meaning escapes us. We are left to wonder why the authors chose to add this step which lacks any apparent theoretical justification. This bring us to question the meaning of the contribution of author Muriel Médard, a professor of information theory at MIT. According to the contributions section she is the one who “contributed to correctness proof and robustness analysis”. Presumably “correctness” meant describing the two steps needed to show that the solution to (1) is (2). But what would actually be relevant to the paper is a theorem about steps 1–7. Unfortunately such a theorem is hard to imagine. When Feizi et al. was published in August 2013, they set up a companion website at http://compbio.mit.edu/nd/ where the code and data was made available (the data is no longer available at the site). On December 4, 2013, the authors updated the website. While there used to be one version of the program, there are now two different versions, one specifically for use on regulatory networks where the default values for the parameters are and the other with defaults . “Network deconvolution” is supposedly a universal method applicable to any kind of network. Will the authors continue to distribute different domain-specific versions of the program, each with their own “default” parameters somehow divined by themselves? The description of the method in the main text of the paper is different from what is in the online methods, which in turn is different from what is in the supplement, which in turn is different from what is actually in each of the (two) released programs, namely the ad-hoc heuristic steps we have described above. Having said all of that, one might be curious whether the “method” actually works in practice. Sometimes heuristics work well for reasons that are not well understood (although they are usually not published in journals such as Nature Biotechnology). Unfortunately, we have to disclose that we don’t know how the method performs on the datasets in the paper. We tried really hard to replicate the results of the paper, running the software on the provided input matrices and comparing them to the distributed output matrices (available on the NBT website). Despite our best attempts, and occasionally getting very close results, we have been unable to replicate the results of the paper. This bothers us to such an extent that I, Lior Pachter, am hereby offering $100 to anyone (including Feizi et al.) who can provide me with the code and input to run network deconvolution and produce exactly the figures in the paper (including both versions of Figure S4) and the output matrices in the supplementary data. Because we couldn’t replicate the results of the paper, we decided to examine how FK performs in one case for which Feizi et al. originally claimed (Supplement version July 14 2013) that their method is optimal. They stated “if the observed network is a covariance matrix of jointly Gaussian variables, ND infers direct interactions using global partial correlations”. This claim was deleted without mention in the updated supplement, however even if network deconvolution is not optimal for inferring a network from a correlation matrix (presumably what they meant in the original statement), the claimed universality suggested in the paper implies that it should be very good on any input. The figure above shows a comparison of the Feizi et al. 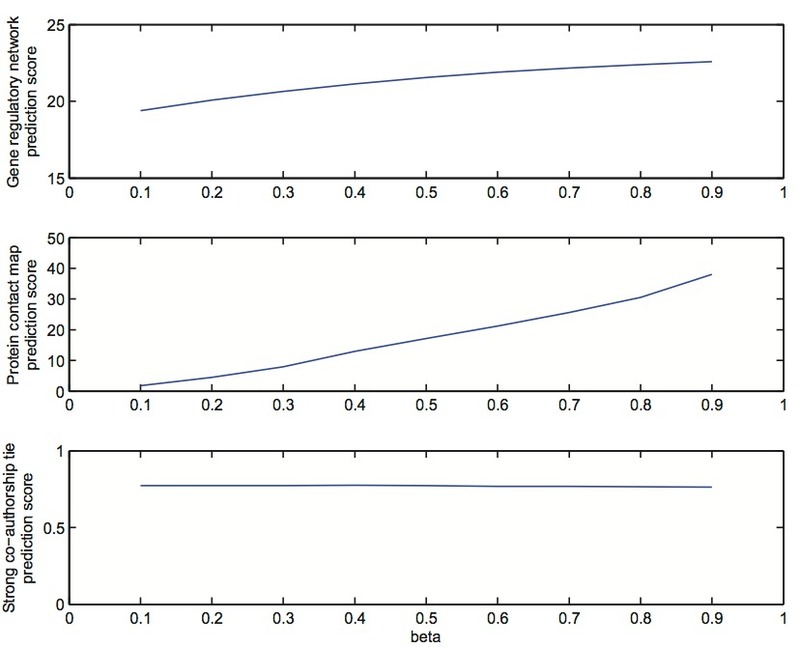 method (FK) with the various beta parameters used in their paper to regularized partial correlation, the “geometric root” (equation (2)) and the naïve method of simply selecting the top entries of the correlation matrix. In order to test the method we performed 40 simulations of sampling 500 observations from a random Gaussian graphical model with 1000 variables and an edge density of 5% to ensure the graph was connected yet sparse. 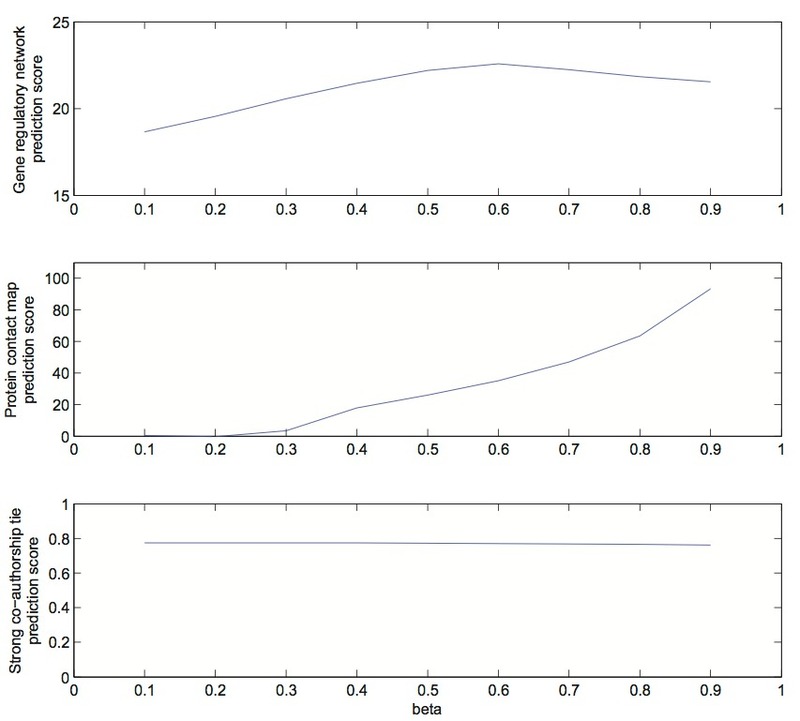 Performance was assessed by comparing the ranking of the edges to the true edges present in the model and computing the area under the corresponding ROC curve. 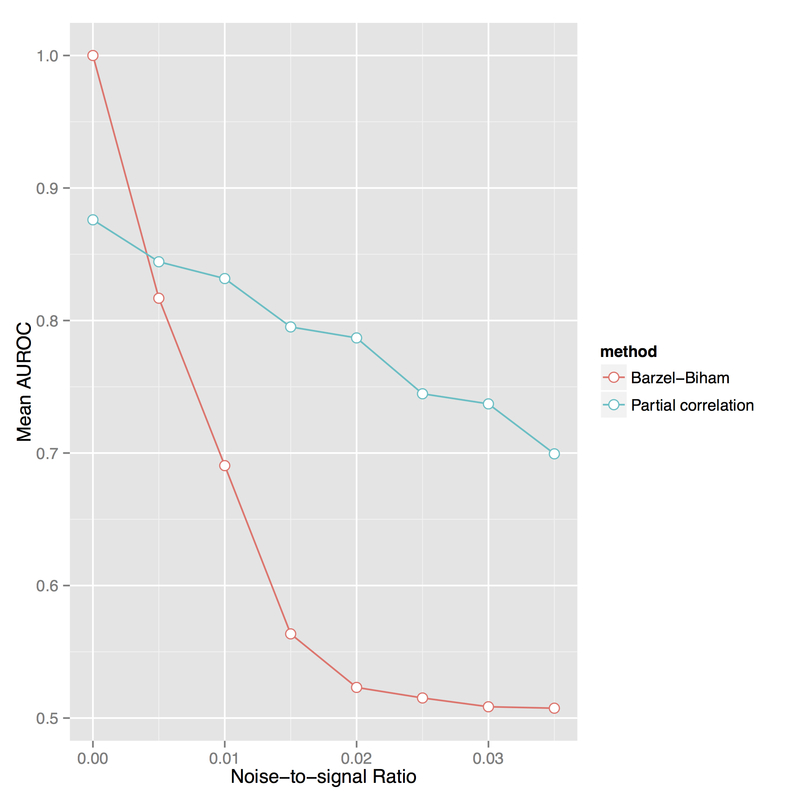 As a benchmark we applied partial correlation structural inference based on a James-Stein shrinkage estimation of the covariance matrix (a standard approach to gene regulatory network inference, described in Schäfer, J. & Strimmer, K. A Shrinkage Approach to Large-Scale Covariance Matrix Estimation and Implications for Functional Genomics. Statistical Applications in Genetics and Molecular Biology 4, (2005)). That FK does better than the most naïve method and yet worse than a method actually designed for this task is perhaps to be expected for a heuristic method that is based on a metaphor (one that dates back to Seawall Wright’s work on path coefficients in the 1920s- although Wright used (1) in the restricted setting of directed acyclic graphs where it makes sense). It is possible that in some contexts, FK will make things somewhat better. However what such contexts might be is unclear. The only guidance that Feizi et al. provide on the assumptions needed to run their method is that they state in the supplement that the model assumes that networks are “linear time-invariant flow-preserving operators”. While it is true that individual parts of that phrase mean something in certain contexts, the complete phrase is word salad. We wonder: is co-authorship flow preserving? the performance of the method on the simplest of all examples, a correlation matrix arising from a Gaussian graphical model, is poor. Post scriptum. After their paper was published, Feizi et al. issued some press releases. They explain how original and amazing their work is. Kellis compliments himself by explaining that “Introducing such a foundational operation on networks seems surprising in this day and age” and Médard adds that “the tool can be applied to networks of arbitrary dimension.” They describe the method itself as a way to have “…expressed the matrix representing all element correlations as a function of its principal components, and corresponding weights for each component” even though principal components has nothing to do with anything in their paper. As with Barzel-Barabási, this seems worthy of nomination for the Pressies. in preparation for Nature Biotechnology. The term “in preparation” is common on academic websites, especially on sites of graduate students or postdocs who are eager to advertise forthcoming work, but “in preparation for” really requires some hubris. We have to wonder, why do Feizi et al. assume that peer review is just a formality in the journal Nature Biotechnology?